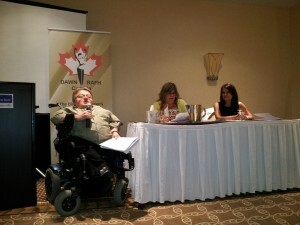 June 19, 2013 (Montreal) – The DisAbled Women’s Network of Canada-Réseau d’Action des Femmes Handicapées Canada (DAWN-RAFH Canada) and the “Canadian Association for Community Living (CACL)” are jointly implementing a pan Canadian initiative entitled: InFocus: Bringing People with Disabilities into the Picture – A National Pan-Canadian Community Leadership Initiative. National meetings are taking place on June 18-19, 2013 in Montreal bringing provincial/territorial and many local organizations together to address two priority issues of concern for people with disabilities and Deaf people – health access and violence and abuse – with a pronounced focus on cancer screening. Local cancer screening sites across the country are being engaged with support from this project, to examine their facilities and procedures for their inclusivity for people with disabilities and Deaf people. In particular, they will look at the experience of women with disabilities and Deaf women in getting adequate access to breast cancer screening. Today’s meeting coincides with the launch of a report on the accessibility of breast cancer screening prepared by DAWN-RAFH Canada on behalf of the Canadian Breast Cancer Network . The 2012 report, entitled “Environmental Scan on Women with Disabilities & Breast Cancer Screening: Identified Problems, Strategies and Recommended Next Steps” examined existing research on women with disabilities and access to health services, in particular, to breast cancer screening. One in nine Canadian women is expected to develop breast cancer during her lifetime. In 2013, there will be an estimated 23,800 Canadian women diagnosed with breast cancer. However, survival rates have increased significantly since the 1980s due to early detection through regular screening and improved treatments. For women with disabilities however, early detection is significantly less likely than for non-disabled women. “Not surprisingly, we found that there are a number of barriers for women with disabilities and Deaf women to access breast cancer screening,” said Doris Rajan, author of the report and senior consultant with DAWN-RAFH Canada. “There are the obvious physical ones like examination tables that are too high, but more pronounced are attitudinal and procedural barriers. 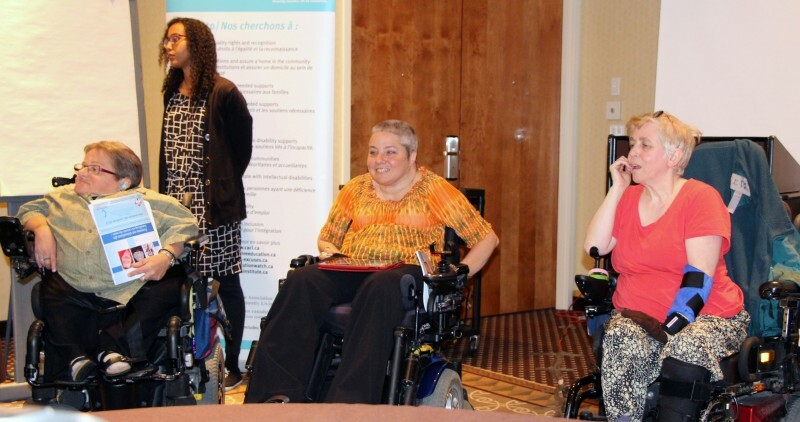 Practitioners expressed feeling uncomfortable when treating people with disabilities and noted communication difficulties in dealing with women with disabilities. As a result, women with disabilities are refused screening and/or have traumatic experiences in attempting to receive it,” Rajan notes. The report’s key recommendations include: addressing physical barriers, i.e. adapting equipment and medical procedures; conducting women-centred, disability sensitive training for breast cancer screening health care personnel; developing disability-positive outreach and health promotion materials in various formats for non-verbal, low-literacy or non-English speaking women; and finally, implementing broader policy reforms. “This report provides us with a better understanding of what the barriers as well as concrete recommendations on how the medical profession and organizations such as CBCN can better serve women with disabilities and Deaf women”, says CBCN president Cathy Ammendolea. She notes that this is part of the CBCN’s effort to ensure that women in underserved populations are getting adequate service. 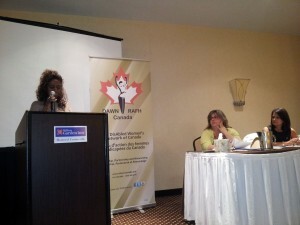 DAWN-RAFH Canada is a national, feminist, cross-disability organization whose mission is to end the poverty, isolation, discrimination and violence experienced by Canadian women with disabilities. 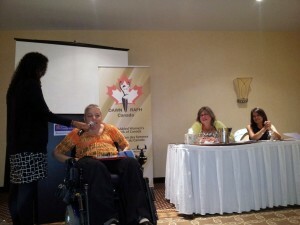 Isabelle Ducharme - Bonnie Brayton - Cathy Ammendolea, president of the Canadian Breast Cancer Network.